THE REVIEW: If any movie could get me back to writing for my blog, it would be a Star Wars movie, and so here I am with a review of Rogue One: A Star Wars Story. Unlike with The Force Awakens I had more uncertainty going into Rogue One about how good I thought it would be or what it would even be about. After a lackluster first trailer my enthusiasm lessened and I took a fairly hands-off approach to the rest of the news and trailers about the film until after I saw it. Now having seen it, my feelings are still up in the air. There are parts I really like, as in, some of the best Star Wars moments of the entire saga. On the other hand, there’s also moments I really dislike, as in, rival some of the prequel trilogy horrors. Some of these dislikes I think are just a kind of shock, unsure of how a movie like this would play out — there have only ever been main “official” Star Wars films before. These Star Wars stories have a much wider range of material, tone, and style that they can cover and Rogue One is our first look at what a movie like that can be. Moments like this include much of the first act as you have to get acquainted to all new characters and worlds never before seen. Combine that with no opening crawl and it’s sort of like, “Is this a Star Wars movie, or just some random sci-fi film?” The further into the film you get, Rogue One’s Star Wars roots come out and shine (and shine brightly towards the end), but there’s a bit of a warm up period to get to that point. This might have been another side effect of my ignorance and trailer avoidance, but part one of my problem might just be my lack of anticipation to see Tarkin return. The second part of my problem gets in to the implementation of this effect and why I don’t think my lack of foresight into the appearance of Tarkin had anything to do with my disappointment. The first shot you see of Tarkin is a window reflection over his shoulder. It looked perfect and my initial shock was over the fact that “Oh my god, Tarkin is back.” That was followed up extremely quickly with an underwhelming, “Oh my god, this isn’t Tarkin.” It very much looks like a video game character place beside live, breathing humans and does not work. And I thought maybe they’d only do this once or twice to bring back a familiar face, but no — Tarkin is more of a main character in Rogue One than he was in Star Wars and Peter Cushing isn’t even here to play him. For very fleeting moments — mostly still shots of Tarkin where he doesn’t move — does the effect look indistinguishable from an alternate reality where Cushing is still alive and looks like he did from 40 years ago. Other than those rare moments, all this does is take you out of the film and make you try to process what is going on, distracting you then from paying attention to the dialogue and what is actually happening in those scenes. What blows my mind is why they just didn’t stick with a much more convincing over-the-shoulder approach for most of the film, shrouding him in secrecy until maybe a reveal at the end where you see his face. Perhaps even more surprising though were the Star Destroyers. No lie, when I saw the first one in the beginning of the film my immediate reaction was, “Is this a LEGO Star Wars movie?” Nothing about it looked real, from the textures to the lighting to the movement of the ship. In some ways the fake Star Destroyer is more baffling to me than a fake Governor Tarkin. They perfected the look of this in the original film and they haven’t looked fake in any Star Wars film besides Rogue One. 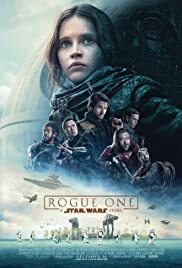 While these are some fairly big detractors and they do really take you out of the flow of the film, overall Rogue One still succeeds at telling a compelling story. We know the basics — rebels steal the Death Star plans — going into the movie, but it’s filling in the details that makes it fun and enjoyable. Rogue One might go a little too far with relying on original trilogy characters to tug at your nostalgia but for the most part the integration is done with respect. It has me hopeful that the next one focusing on a young Han Solo will continue the positive track for the franchise and potentially open more doors for stories about completely new characters and worlds in the Star Wars universe.